Gastroesophageal Reflux Disease, known as GERD, is a condition that allows stomach acid to move up from the stomach into the esophagus. Repeated episodes of reflux burn the lower esophagus and can cause irritation and inflammation resulting in heartburn.Normally reflux is prevented by a circular muscle called the lower esophageal sphincter or LES. 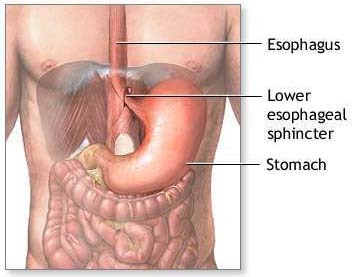 The LES lies between the lower esophagus and stomach. When this muscle is weakened and not functioning properly reflux occurs. Reflux can occur after eating large meals, when wearing tight clothing around the waist, or even when bending over. Initially the first step in treating GERD involves lifestyle changes such as exercise, weight loss, and changes in diet. In addition, certain medications that help reduce gastric acidity also aid in relief of heartburn symptoms. When lifestyle changes and medication therapy are ineffective the next step to consider is surgery. Laparoscopic Nissen Fundoplication is a minimally invasive surgical procedure performed to treat GERD. This procedure involves wrapping the upper portion of the stomach around the lower part of the esophagus. The minimally invasive approach consists of five small incisions to the abdomen. Many patients experience a minimal amount of pain and discomfort after surgery. At the Institute nursing care is focused on aggressive pain management and ambulation to promote your recovery from surgery.